The En Francais style moustache is often worn by men sought after for their refined tastes in wine and women. We've asked Jeremy Szafron a TV Host / Producer to sport this silk Holts tie on the runway. It can be yours - just place a bid! 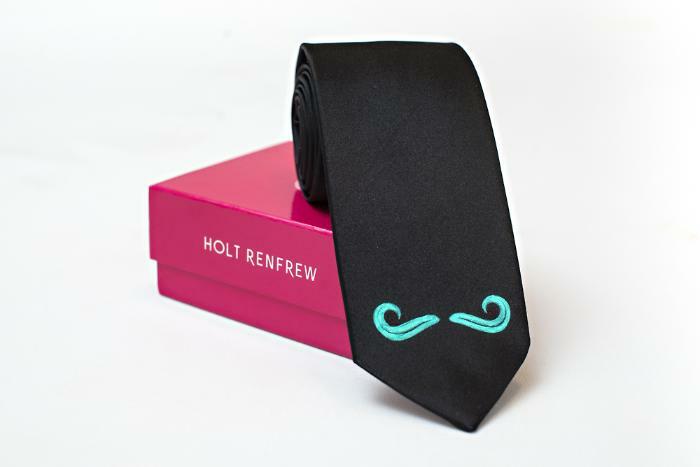 This is a unique silk tie especially ordered by Holt Renfrew for Movember. All moustache designs were created by and hand silkscreened by a local illustrator - Chenoa Gao. 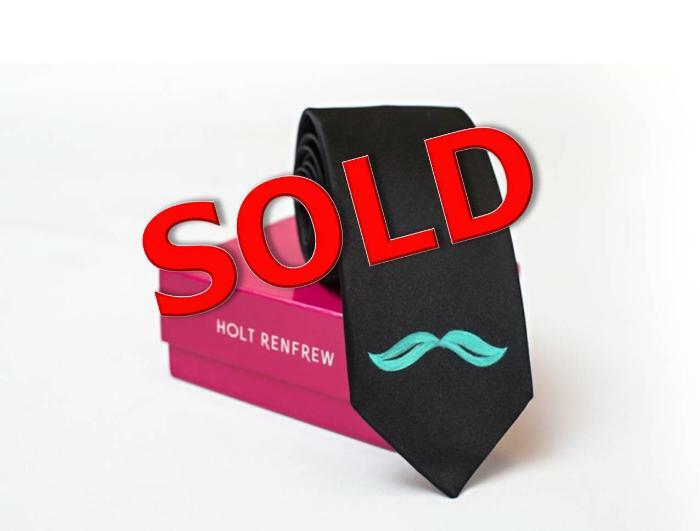 Anyone wishing to beat the competition outright can bid $500 and the tie is YOURS! The Balbo style moustache is often grown on a man without fear - one who is bold, stylish and self-confident. We've asked Akash Sablok, who is the President of BC Notaries and a Tech & Auto Journalist to model this silk Holt Renfrew tie on the runway. It can be yours - just place a bid! The Chevron style moustache is a classic. People sporting this moustache is known to be confident and reliable with refined manners. 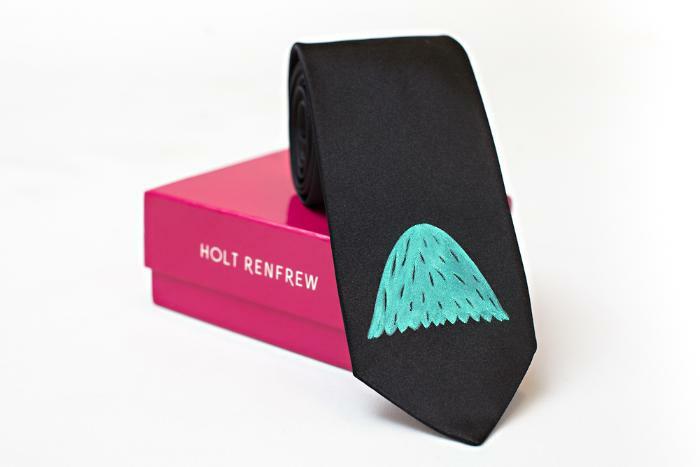 We've asked Andrew Chang, Host of CBC News Vancouver to sport this silk Holt Renfrew tie on the runway. It can be yours - don't be shy, just place a bid! The Dali style moustache is known to be a mark of a genius who doesn't care what the world thinks of him. 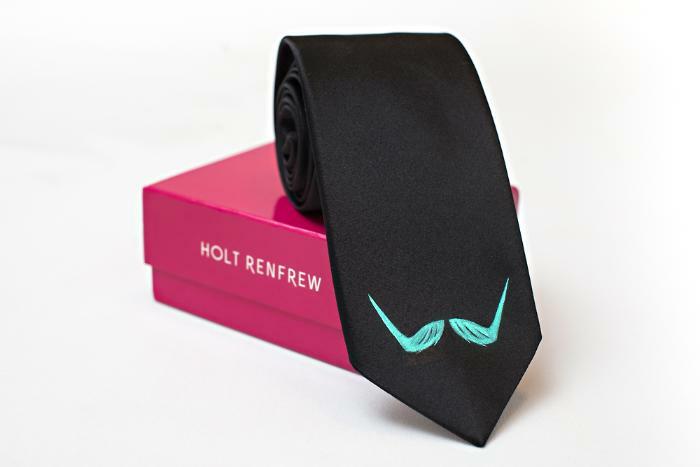 We've asked Andrew Reid, President & Founder of Vision Critical to wear this tie down the runway. It can be yours - don't be shy, just place a bid! The Dandy style moustache graces the face of playful and comedic men with a contageous personality to always find humour in life. We've asked Kyle Vucko, CEO & Co-Founder of Indochino to sport this silk Holts tie on the runway. It can be yours - just place a bid right now! The English style moustache is grown by a man of substance and people often envy his composure and charm. 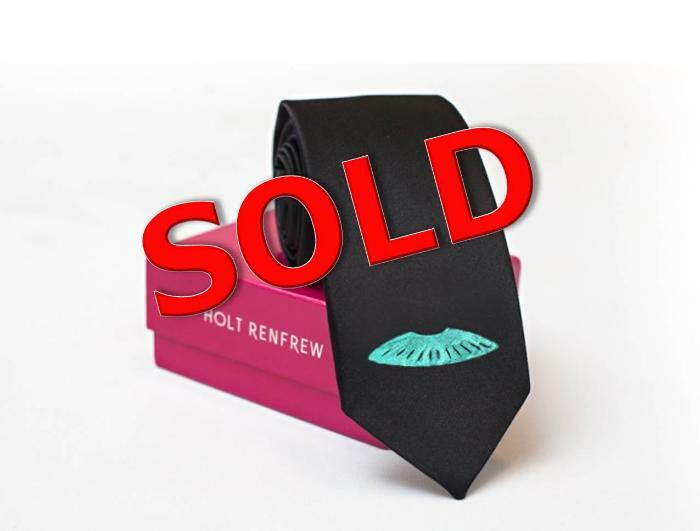 We've asked Steven Schelling, PR/Stylist, to sport this silk Holts tie on the runway.It can be yours - just place a bid! The Gable style moustache is one recognised by many as the choice of men who are romantic and is not afraid to kiss in the moonlight. 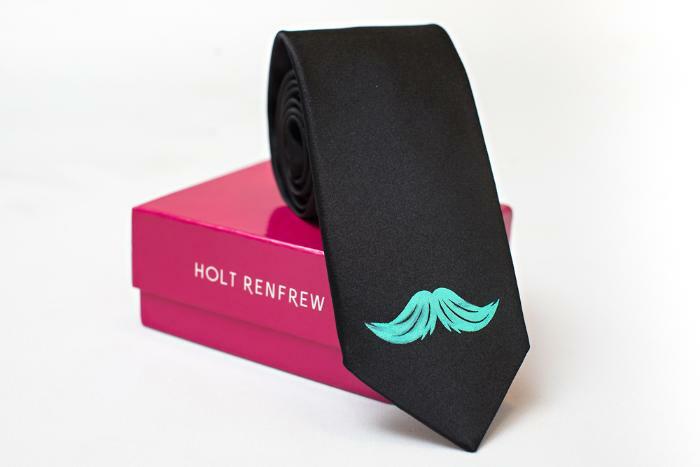 We've asked Todd Talbot, a Host of Love It or List to wear this silk Holts tie on the runway. It can be yours - just place a bid! The Gunslinger style moustache is grown by men who will defend your honour and appreciate the finer things a lady brings to life. 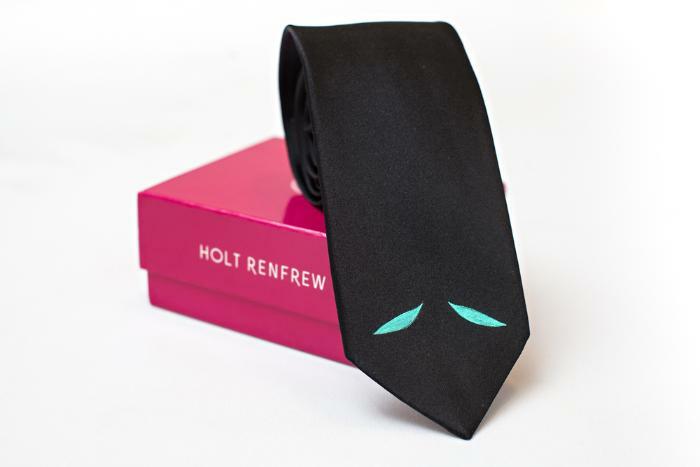 We've asked Jay DeMerit, Whitecaps, ex-USA National Team & World Cup player to wear this silk Holts tie on the runway. It can be yours - just place a bid! The Handlebar style moustache is often seen on chivalrous men who take a deeper look at things rather than acting impulsively. We've asked Angus Reid, Former CFL All-star to sport this silk Holts tie on the runway. It can be yours - just place a bid! The Imperial style moustache is grown by men who are poised and confident with impeccable mannerism. 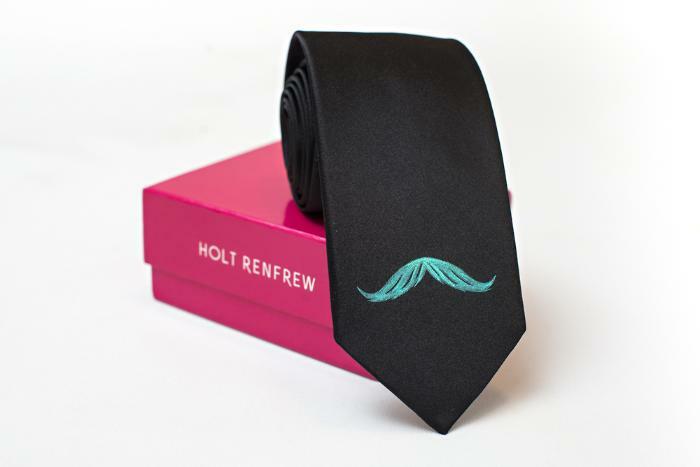 We've asked Tommy Europe, Former CFLer / Host of Last 10 Pounds Bootcamp to sport this silk Holts tie on the runway. It can be yours - just place a bid! The Jacque style moustache is grown my men who are considered spontaneous and always ready for a good time, as well, he's not afraid to spark conversation. 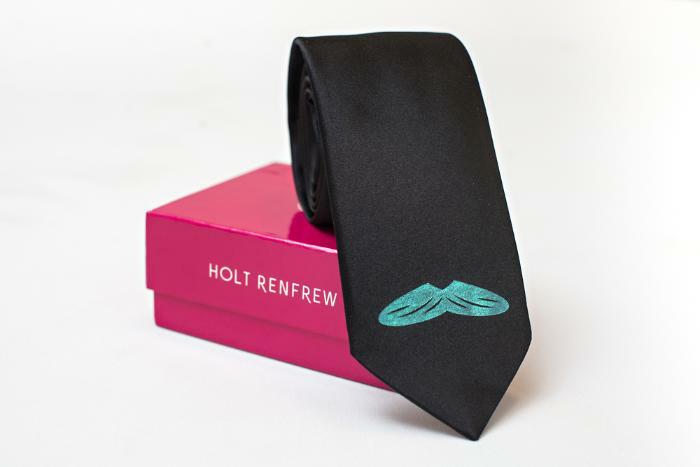 We've asked Branislav Henselmann, Executive Director of Ballet BC to wear this silk Holts tie on the runway. It can be yours - just place a bid! The Magnum P.I. style moustache is considered a symbol of 'work-hard, play-hard' and is often worn by men who always find time to share a hidden smile with the ladies. We've asked Michael Eckford, a Host of CKNW radio to work the runway with this silk Holts tie. It can be yours - just place a bid! The Oil Baron style moustache is grown by men who prefer tailored suits and is known to be able to offer a sophisticated toast at any social gathering. 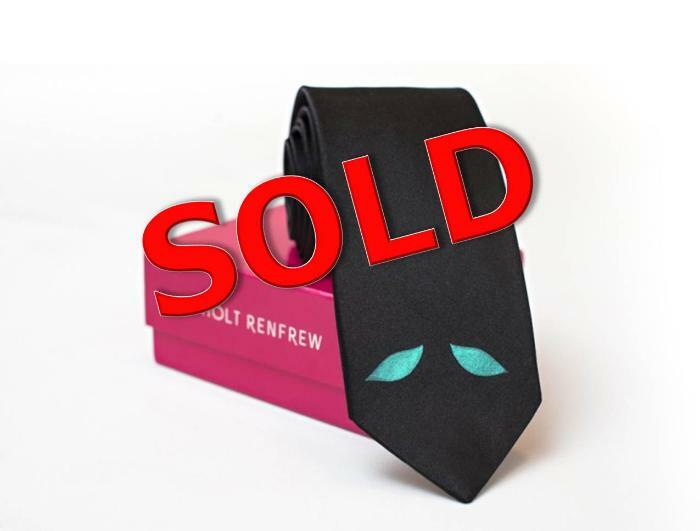 We've asked Kenton Boston, Vice President News at Shaw Media to sport this silk Holts tie on the runway. It can be yours - just place a bid! The Pencil style moustache is for the very focused and passionate who believe 'Work is Worship'. 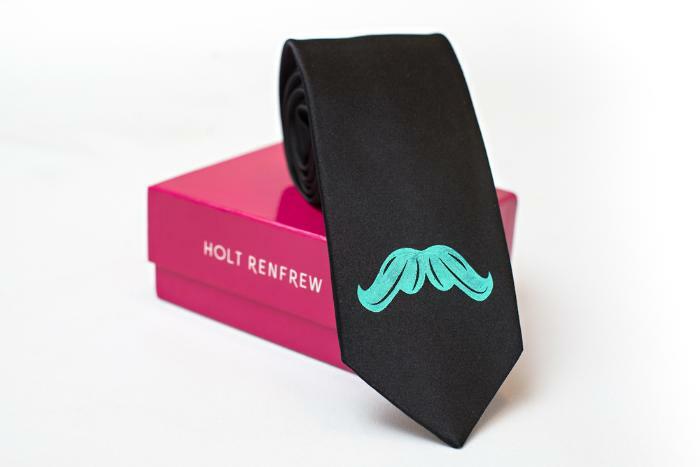 We've asked Ryan Steel from The Amazing Race Canada to sport this silk Holts tie on the runway. It can be yours - just place a bid! The Professor style moustache is grown by men respected for their experience, knowledge and ability to effortlessly mesmerize a crowd. We've asked Tom Gierasimczuk, publisher Vancouver Magazine, to work the runway with this silk Holts tie. It can be yours - just place a bid! The Prospector style moustache is a signature look for men who are recognised for their positive outlook - when things don't go his way, he picks himself up and tries again. We've asked Jonny Staub, Morning Show Host at the Beat 94.5 to sport this silk Holts tie on the runway. It can be yours - just place a bid! The Pyramid style moustache is grown by the suave and charming who motivate others to see the light at the end of the tunnel. We've asked Steve Burgess, a Freelance Humour Writer to work the runway in this silk Holts tie. It can be yours - just place a bid! The Young Gun style moustache is a signature look for men who are always learning, loving life and consistently seeks the most out of it. We've asked Milun Tesovic, Founder of Metrolyrics (CBS) to sport this silk Holts tie on the runway. It can be yours - just place a bid!